The last Saturday of every summer month sees the free Petworth Jazz Project at the park at 8th and Taylor. 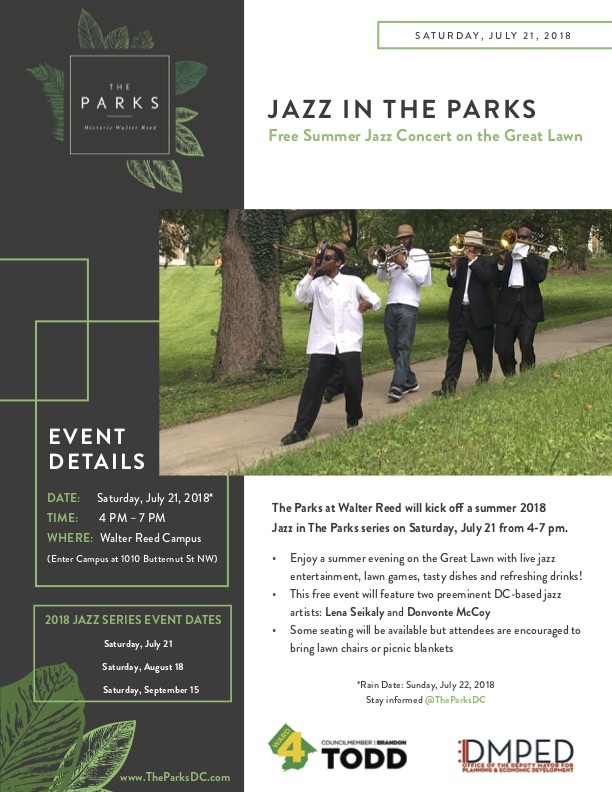 And if you're looking for one more free, outdoor jazz show that's great for the whole family, The Parks at Walter Reed (1010 Butternut Street NW) has a series great jazz shows starting this weekend, Saturday, July 21st from 4-7pm. The shows are presented by The Parks at Walter Reed, working with Petworth's own local jazzman Tom Pipkin -- which means you know it'll be a great show for neighbors to come out and enjoy. The Parks will put on free shows for the community to enjoy starting July 21st, with the next show on August 18th and the last show on September 15th -- all from from 4-7pm. Each concert will feature a different set of local DC jazz artists in addition to accomplished female voices of jazz. You've heard many at the Petworth Jazz Project over the years. The featured artists include: Lena Seikaly, Donvonte McCoy, Cecily, Corcoran Holt, Heidi Martin and Tyler Leak Quartet. Each artist offers their own distinct style and have played at venues across the city. "I am delighted to have the opportunity to curate this summer's Jazz In The Parks concert series," Pipkin said. "It is a tremendous line up, and what better to enjoy than among your neighbors, friends and family. One of the things that makes jazz performances like this so, so special, and that is often overlooked, is the 'all ages, outdoor' aspect. Taking jazz from the bar and shedding light on it, so to speak. Ward 4 is definitely the home of jazz and community this summer." Come out and hang on the Great Lawn (bring your own blankets and chairs) to enjoy live jazz and lawn games, with food trucks, kid-friendly drinks and adult beverages available. There will be limited seating available. Parking is also limited. It's great to have another outdoor music series in our neighborhood. If it rains, all shows will be rescheduled for the immediate following Sunday from 4-7 pm. For more info, follow The Parks on Twitter @TheParksDC for regular updates or email them with individual questions.